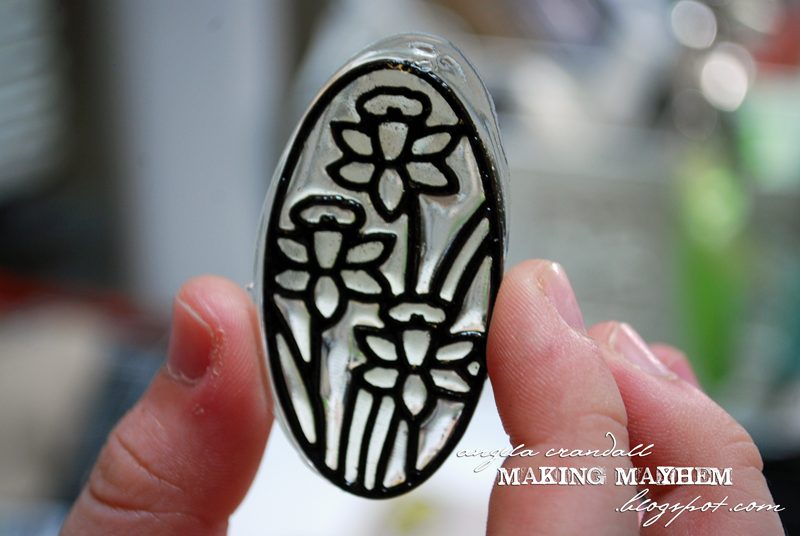 Have you ever wanted to create a design in stained glass? Beautiful, translucent colors outlined in silver or black? Me, too! 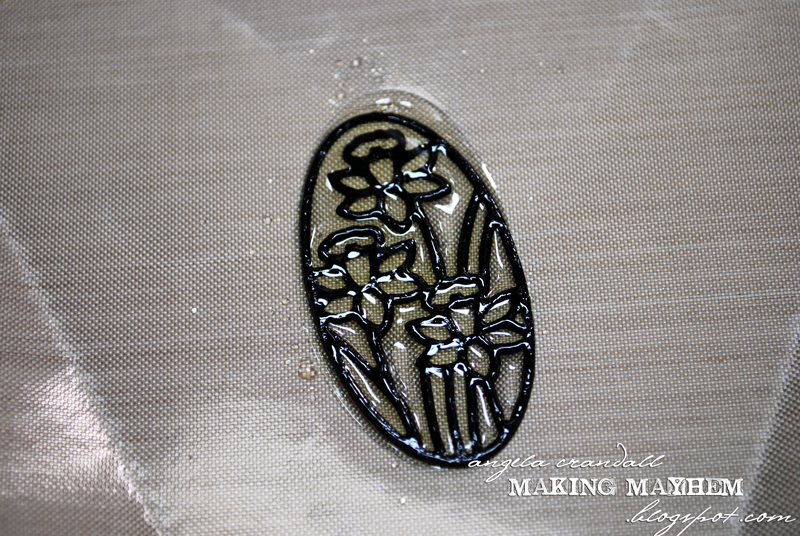 Today's project is an easy faux stained glass. 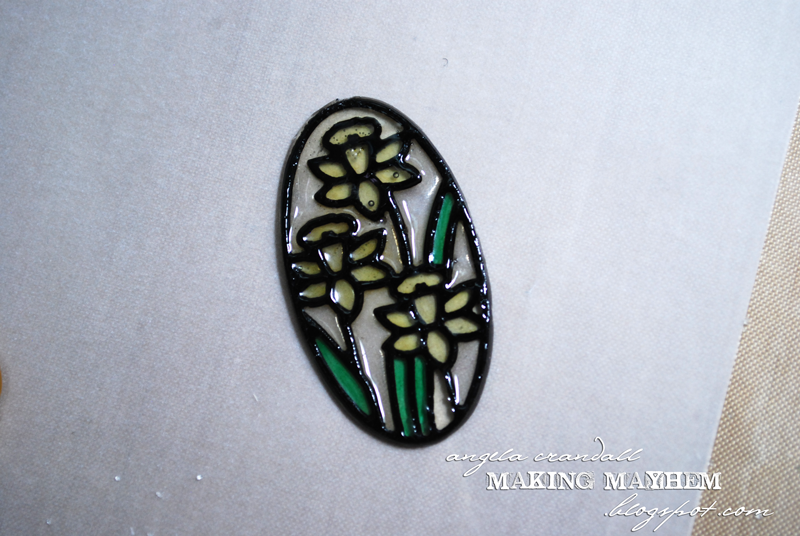 When I saw the Floral Eggs in the New Spring Release, they reminded me of stained glass hanging in the kitchen window when I was growing up and I knew what I would be creating next! Floral Eggs is a set of 15 - 3 of each gorgeous design. 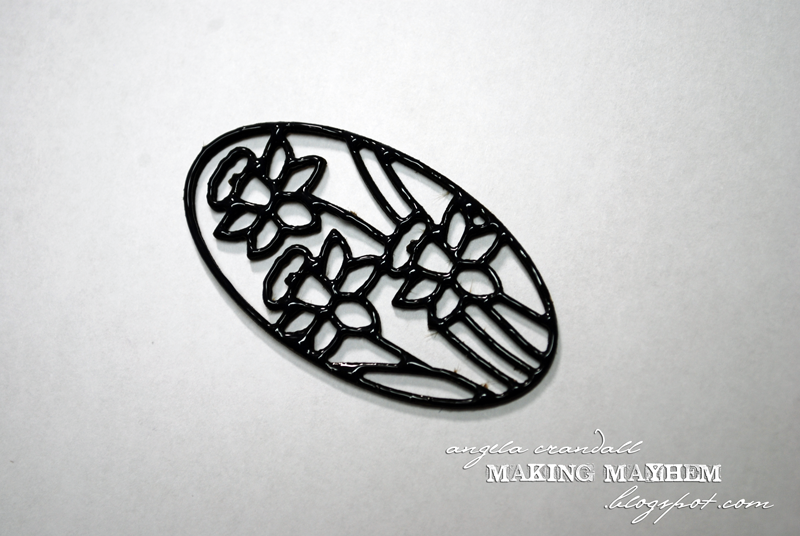 Choose your favorite and go over the design with the Mars Black 3D Enamel Gel. Let dry. Warm up the Melting Pot. 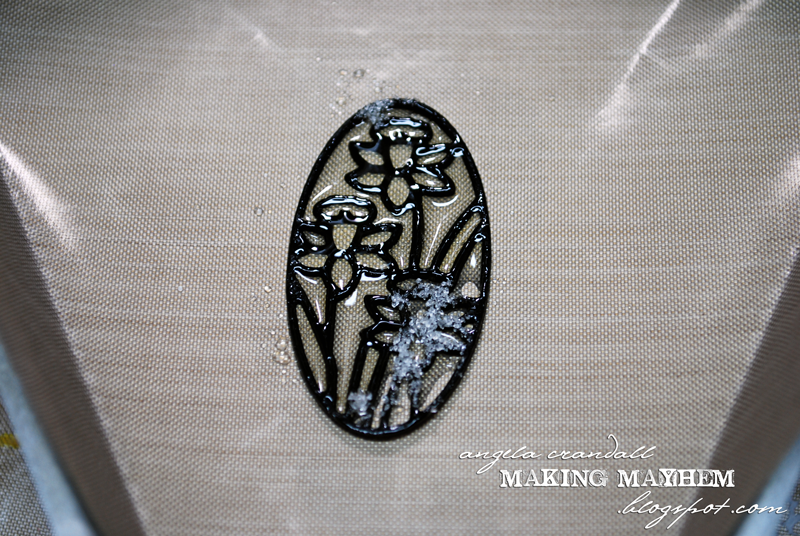 Place a craft sheet in the tray and lay the Floral Egg on top. Sprinkle the Ultra Thick Clear Enamel Powder liberally over the piece. Try to keep most of the powder over the egg, but don't worry if it gets outside the design. Turn off the Melting Pot and let cool. Gently press on the edges to flatten the egg, if necessary, as it cools. Once completely cool, remove the egg from the craft sheet. Use scissors to trim off any edges. 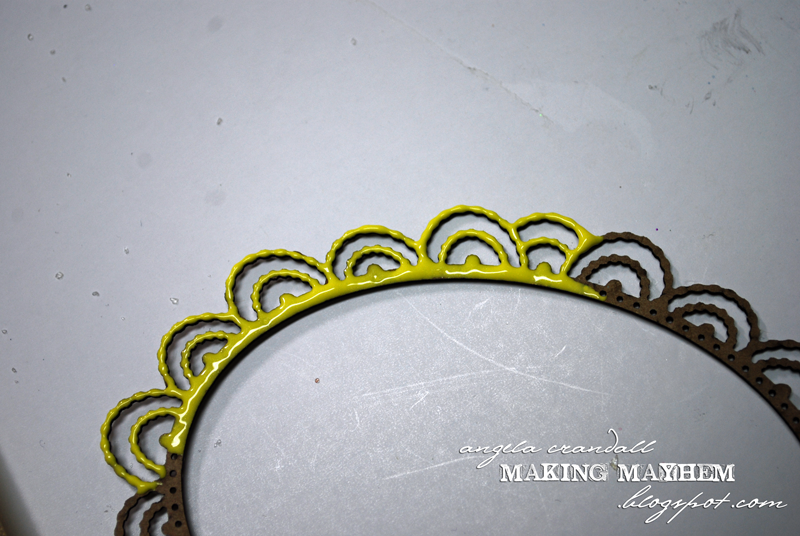 Using the Daffodil Pearl 3D Enamel Gel, trace over the design on the decorative frame from the French Oval Frame Kit. Set aside and let dry. Die cut the front of the card base using the Mini Baroque die. Die cut a green panel and the vellum cardstock using the Baroque die. Cut out the middle of the green panel using the Mini Baroque. Adhere panels using the photo for reference. Using Glastique, apply a thin layer to the back of your egg and adhere to the vellum. Decorate with pearls and your favorite sentiment! love it --- I have a stained glass in my kitchen window now - and I love how you did this. Fun technique! I love your stained glass! Love the stained glass technique, it looks wonderful inside the French Oval frame. Beautiful! !